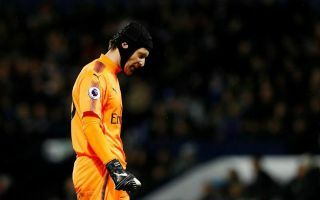 Arsenal goalkeeper Petr Cech set an unwanted personal record today in the 1-0 defeat to Tottenham that sums up just how far he and his team have fallen. The Czech Republic shot-stopper conceded in the 49th minute as Harry Kane kept up his remarkable North London derby record to hit the winner. Kane, 24, is now on seven goals in seven games in this fixture, but for Cech it was a rather more miserable afternoon. The former Chelsea ‘keeper has long been regarded as one of the best ‘keepers in the world but no longer looks at his best as he’s now gone nine games in a row without a clean sheet in the Premier League. 9 – Petr Cech has now failed to keep a clean sheet in any of his last nine Premier League appearances – his longest ever run without one in the competition. Leaked. This is Cech’s longest run of his career, and it’s little surprise given the state of the defence he has ahead of him at Arsenal compared to his Chelsea days. The veteran shot-stopper actually had a decent game at Wembley today, keeping out a superb Christian Eriksen free-kick to prevent the home side winning by a greater margin. Still, the 35-year-old’s recent form must be a concern for the Gunners, who look in growing need of a replacement in that position. Given Cech’s age when they signed him just a few years ago, it is little surprise to see he is already past his best as he was surely never likely to be anything but a short-term solution to that area of the pitch. Infuriatingly for Arsenal, they let a perfectly good replacement in the form of Wojciech Szczesny leave for Juventus in the summer after two years on loan at Roma, where he looked much improved and ready to come back to take the no.1 shirt in north London.